Lawyers met Maulana Nizami in Kashimpur jail; gets instruction to file review petition on time. A delegation of lawyers today (16th March, 2016) met Bangladesh Jamaat-e-Islami’s Ameer and former minister Maulana Matiur Rahman Nizami at the Kashimpur Central Jail. Advocate Matiur Rahman Akanda, Advocate Mashiul Alam and Barrister Nazib Momen were the members of the lawyer’s delegation. During the meet, Jamaat Ameer asked the lawyers to file review petition within the timeframe. 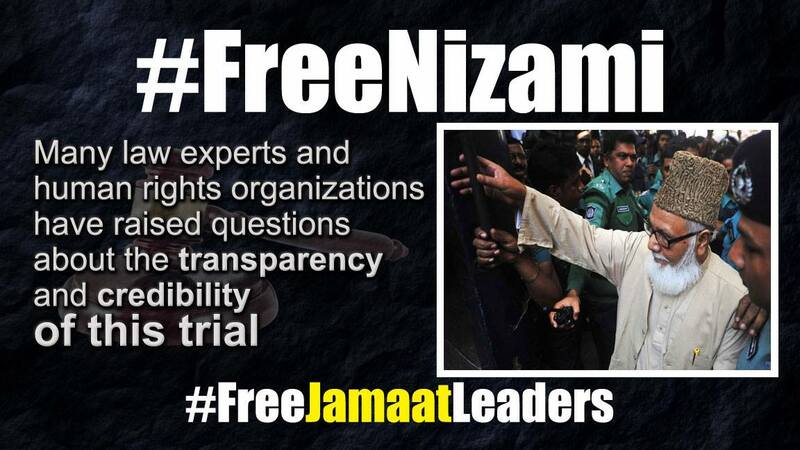 The full verdict of the Appellate Division has been handed over to Jamaat Ameer today through the jail authority. 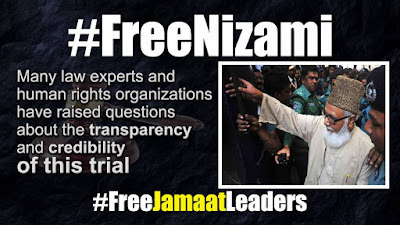 Detained Jamaat Ameer pointed out different facts and issues of the case to his lawyers and said, he has been sentenced to death on the basis of some false and concocted charges. The government has implicated him with two incidents of Pabna districts and produced false witnesses before the court to ensure his conviction. I had gone that place for the maiden time during the electoral campaign of 1986 parliament election. Prior to that campaign, I had never gone over there. But I have been convicted and sentenced in connection of a incident of that area which had taken place during the liberation war of the country in 1971. I have been awarded with death penalty with the charge of genocide in Dhulauri area. One witness of this charge claimed in the tribunal that some 300 men had been killed in the incident. Another witness testified the number as 30 and another witness claimed that only 15 witnesses had been murdered. Such inconsistencies and dissimilarities of the witnesses proved that the allegation brought against me is completely false and bogus. The prosecution also failed to place any substantial documents to prove the allegations against me. 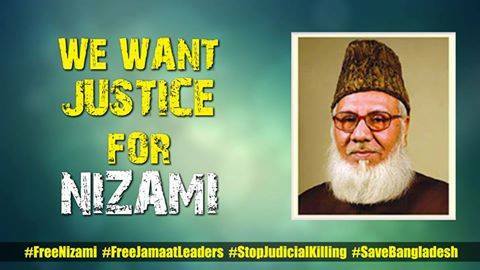 Ameer-e-Jamaat stated that, I firmly believe that Allah is the supreme decider of life and death. I will not die a single minute before and after the time, which has been fixed by the Almighty Allah. If I am murdered with on false charge, that would be martyrdom. I truly wish to be a martyr. The martyrdom certainly glorifies the life. Maulana Nizami claimed the government’s blue print design to kill me in connection with some false charges and it would be exposed before the people one day. The doctrine of the Almighty Allah would be victorious on this sacred land. He conveyed salam to the countrymen and sought cordial prayers from the people so that he can face the heinous conspiracy of the government till the last day of his life with boldness and courage.